The other day we put up a post on the problems of sewer backups that can be caused by a major disaster or flooding. Remember that after a major disaster or disruption of services that many of the flood control systems may cease to function. This includes pumping stations and even dam failures. The following is information that may help you cleanup if you are affected by either flooding or sewer backups. Once the floodwaters have receded and the property can be accessed safely you should begin cleanup. The most important steps are to restore the environment to a dry state and salvage any valuable property. The longer that water/waste are allowed to remain in your home or on your property, the greater the potential for illness and irreparable damage to your home and its contents. If you have the use of pumps and dehumidifiers, they will be helpful in restoring dry conditions. In any sewer backup or flood cleanup project regardless of the source, one should assume that pathogens are present and take appropriate precautions. Always wear protective gloves, eyewear, and boots. Rain gear is also advisable. Avoid direct contact with sewage material, and be particularly careful of your face and eyes. Goggles are recommended when using a hose and/or any chemicals. Protect all cuts and scrapes. Immediately wash and disinfect any wound that comes in contact with sewage. The following steps should be taken to mitigate the microbial risk from a building contaminated by a sewer backup. Sort damaged contents into piles to be repaired or discarded. Use the following guide for discarding of household material and furnishings. Medicines and medical supplies, unless completely sealed in watertight containers and then properly disinfected. Food is always a problem because it may be in short supply. The following link is to a blog that we wrote on possible methods of savaging foods. What About Your Food Storage after a Flood? Disinfectants are typically chemical agents that reduce significant numbers of pathogens to levels below those expected to cause disease. Cleaning and disinfection are two different processes. Cleaning removes the dirt. The processes of disinfection and decontamination are important to ensure the elimination of pathogens and organisms that were contained in the sewage or that grew during the period of contamination. Even concrete can be colonized and broken down by microorganisms if it is allowed to remain wet and contaminated by organic matter. Many household products are capable of disinfecting surfaces and should be used in accordance with manufacturer’s label directions. A household bleach solution is also an effective disinfection agent, and can be made by combining one quarter cup of household bleach to one gallon of water. Bleach should never be used directly without dilution since, in this concentrated form, the bleach can cause severe skin and respiratory hazards. The majority of the microbial population from sewage backups onto lawns, tarmac and paved areas will be inactivated within several days due to exposure to UV radiation from sunlight. A disinfectant can be used on tarmac and paved areas. Contamination on grass could be left to degrade naturally. Typically, bacterial numbers on turf are reduced to background levels expected in the environment within 13 days, but can extend to 20 days on soil and sand in the autumn and spring. Generally, the least absorbent or pervious surfaces absorb the least sewer and bacterial concentrations and return to background levels the quickest. After a sewer backup or flood, if things can be easily replaced get rid of them. After TEOTWAWKI, the problem becomes much harder. Use your head and salvage what you can, but don’t make yourself sick by taking to many chances. This entry was posted in lighting, Sanitation and tagged sewer backups. Bookmark the permalink. Good reminders on the pitfalls of flooding. One thing many folks forget about are appliances that are plugged in and standing water. We found that out many years ago. An electrical shock will impress this upon your memory very quickly. Also, I didn’t know that concrete could be broken down by microorganisms. Good info. You want to detect possible sewer backup before it gets into your home. It’s an unpleasant, stinky experience and can be very damaging. In our last home, the sewer would start backing up every 3 or 4 years because of the trees near our home. We eventually noticed the pattern and were able to take preventative measures. Just keep an eye out for any unusually slow drains. Good safety tips to avoid any spread of disease. A professional should really be in charge of dealing with sewage issues but you should follow these guidelines if you have no choice. Thanks so much for sharing. Just from the look of that picture, that sewage back up did a number on your house. It always scares me that my sewage will back up and wreck my home. 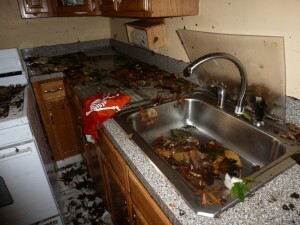 After reading your article, I totally get why it is so imperative to wear gloves when cleaning up after a flood. There’s no telling what kind of diseases and problems are in that water.